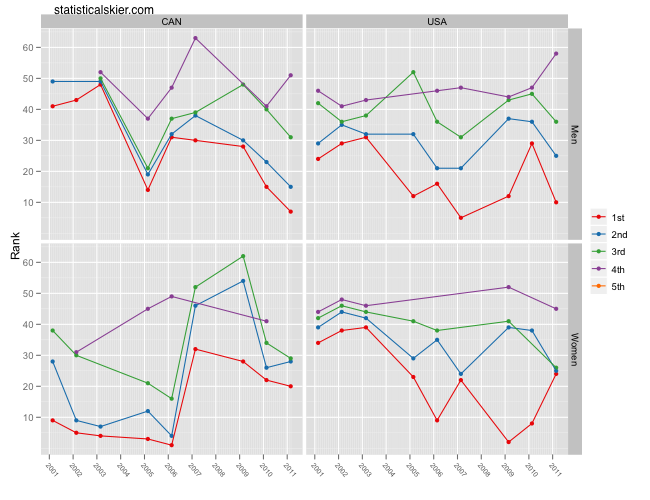 The day after the race may seem early to start doing serious evaluations, but I thought it would be interesting to take a look at different nations’ performances in championship sprint races over time, to put yesterday’s race in some context. The y-axis is an athlete’s result in the race. The colors group together each category’s best, second best, etc. result over time. The lines will sometimes cross as a result of there being different numbers of athletes competing from year to year. As you can see, despite Alex Harvey’s mishap yesterday the Canadian men still had a pretty strong day overall. The US men have been up and down a fair bit over the years, including a pretty bad one last year in Vancouver. But yesterday probably was about average, given recent year’s performances. The US women of course didn’t expect to see their red line (their best result) shooting up like that. However, they may take some solace in that they had a somewhat stronger performance by the rest of the team, as their 2nd, 3rd and 4th best results saw modest to significant improvements over the previous few seasons. (It’s important to note here that I’m intentionally comparing performances only to OWG and WSC events, since the number of skiers nations can enter is different which can make the fields somewhat weaker. So the fact that the US women’s 2-4th best sprinters saw improvements is a “real” improvement compared to past WSC/OWG races, not just a result of a weakened field.) The Canadian women saw a huge drop-off with Beckie Scott’s retirement in 2006, but they have been improving, although yesterday’s race was probably only a modest improvement over the Olympics last year. For some reason I was surprised by the steady decline of the German sprinters. The Russian men, clearly improving considerably over recent years, truly had a bad day yesterday. The Finnish women also really struggled yesterday. Hopefully Krista Lähteenmäki and a healthy Aino-Kaisa Saarinen can make up for it in some of the distance events. Posted by Joran on Friday, February 25, 2011, at 9:30 am. Filed under Uncategorized. Tagged oslo, performance, recap, Sprint, trend, WSC. Follow any responses to this post with its comments RSS feed. You can post a comment or trackback from your blog.